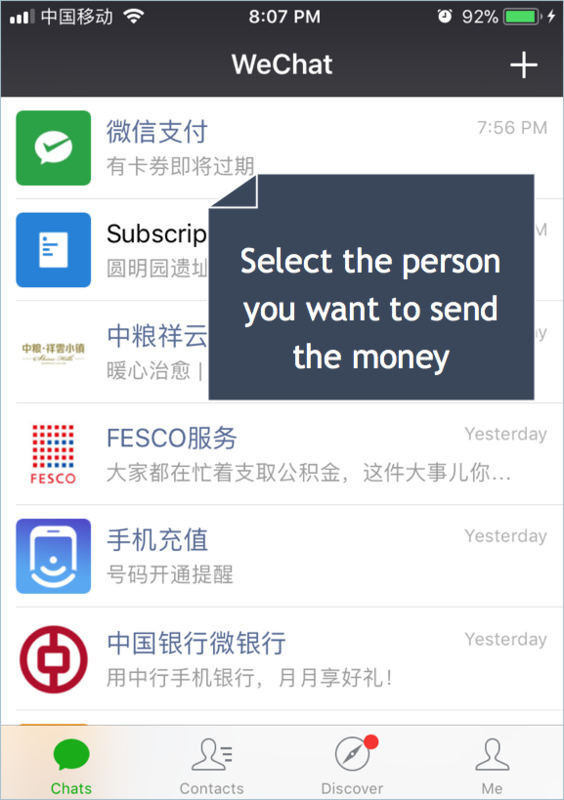 Home » Tech Tips » Apps » How to Do Money Transfer in WeChat Accounts? WeChat is the one of the popular payment channels in China along with Alipay. It is the most suitable option for expats and foreigners in China as creating WeChat account does not require the ID card. Also WeChat payment is commonly accepted from the road side vendor to big shopping malls, making the life easier. 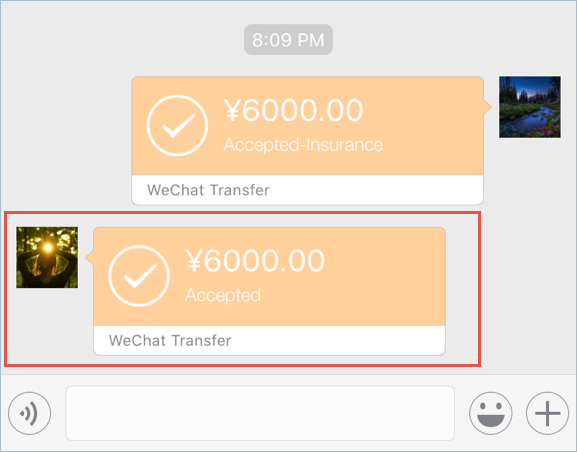 Besides vendor payments, you can also easily transfer money from your WeChat account to any of your friend’s account. For example, when your Chinese friend pay money for you at the restaurant, you can instantly transfer the amount using WeChat. 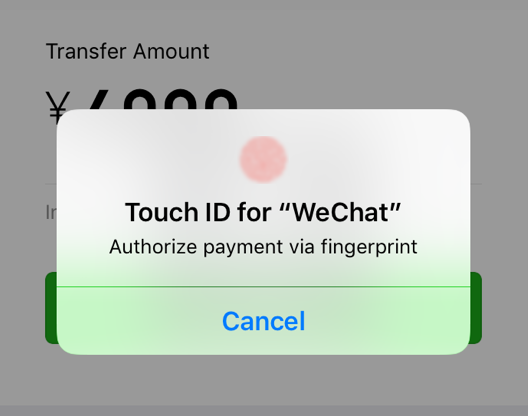 In this article let us explain the step by step process of transferring money to another WeChat account. What You Need for Money Transfer? Your own WeChat account. You can download and install WeChat app from any of the mobile app stores. The receiver is added in your account as a friend. You have added a payment method using your bank card or have sufficient balance in your WeChat balance. Now let us go through the step by step process. First open your WeChat app and choose the friend you want to send money under “Chats” section. Once the receiver is selected, tap on the + button next to the input box. You will see multiple options and tap on the “Transfer” button. On the next screen, enter the amount to be transferred to the selected person. 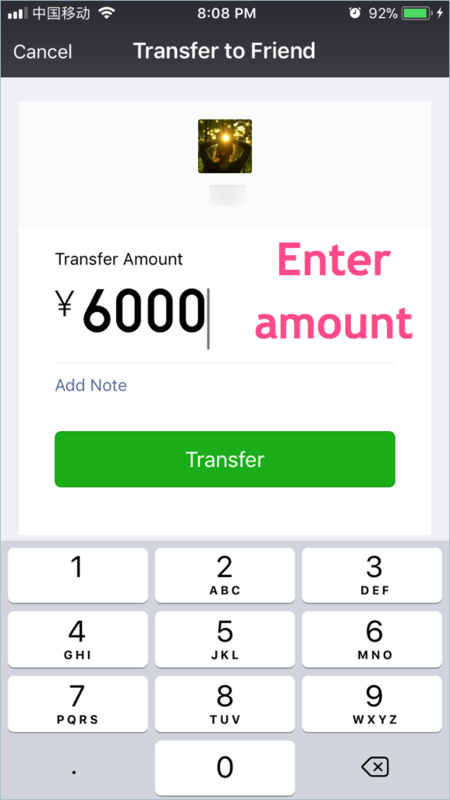 You can also enter a note for the receiver to understand the purpose of the money transfer. 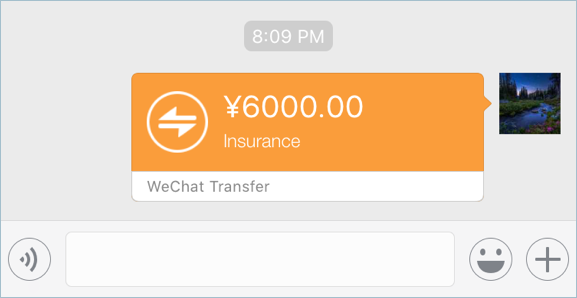 In our example, we enter 6000 RMB and add a note “Insurance”. Finally tap on the “Transfer” button. 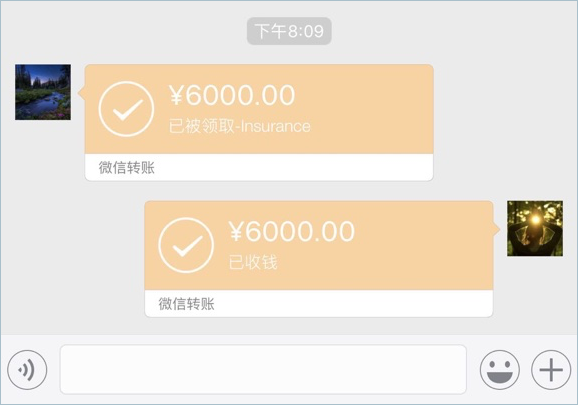 WeChat will automatically select the payment mode based on the available balance. If you have sufficient balance then the WeChat balance will be used for payment. Otherwise the connected bank card will be used for the payment. If you have multiple cards or want to add a new payment card then touch the payment option as shown in the above picture. You will be seeing all the connected bank cards along with the WeChat balance and the option to add a new card. Once the payment mode is finalized, authorize the payment using touch id or password. Now that the money is transferred from your side and you will see a message in the chat section like below. You can tap on the message to view details of the transfer. Once the money transfer is accepted, you as a sender will receive a confirmation message. The previous message will also be changed from the transfer symbol to the tick mark with the “Accepted” word. You can tap on any of the messages to see more details on the time of receipt. The sender will instantly receive the message on money transfer in his / her WeChat account. The note message entered by you will be shown in the message (we have entered a note “insurance”). He / she can tap on the message and accept the money to transfer. The amount transferred will be added to the receiver’s WeChat balance. 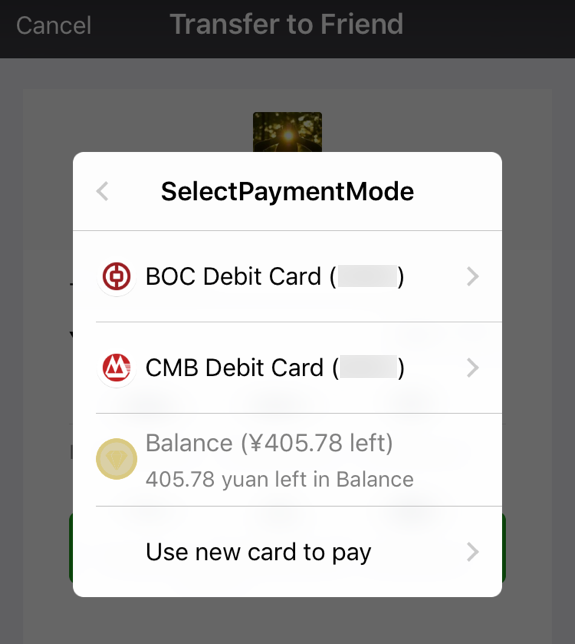 Receiver can withdraw the balance to the bank card from WeChat balance. Well, WeChat enables a very simple way to transfer money but remember the followings before sending money to any unknown person. There is no way to stop the money transfer once it is sent. Even the receiver can’t reject the transfer. The transfer will be in waiting for acceptance status for 24 hours from the time of sent. If the receiver not accepted the transfer within 24 hours then the transfer will be cancelled. The amount will be sent back to the sender’s WeChat account. There will no separate receipt or invoice (called fapiao in Chinese) issued for WeChat transfers. So only use money transfer within your informal friends circle. When you need a fapiao, pay through appropriate channel with the proof. Avoid using money transfer to personal accounts on shopping malls. Instead show your vendor payment bar code / QR code so that the cashier can scan with the scanner. Your vendor payment code can be seen by tapping “Me > Wallet > Money”. 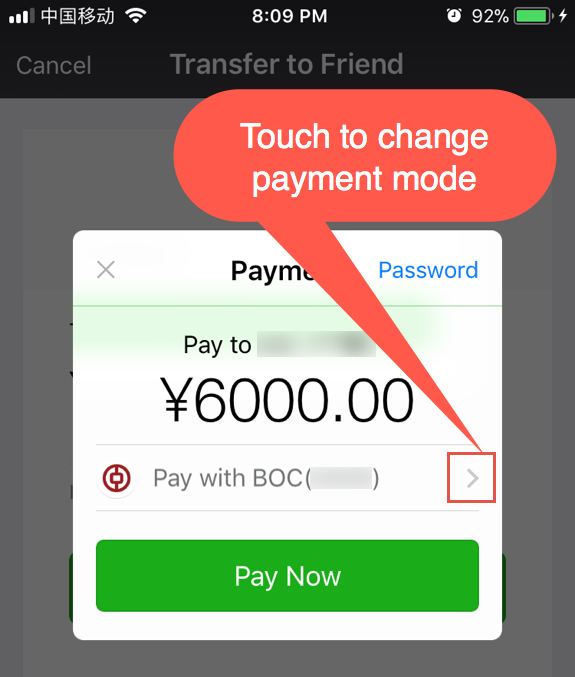 You can also find the vendor code quickly by tapping the + button on the top right corner of the WeChat app and then tapping “Money” option. How do I send money from Canada to China on WeChat? If you are in China, simply follow the process as explained in the article. It is not an international money transfer app. how about someone send a red packet but suddenly the receiver doesnt have any bank card, is there any way to send back the red packet? Yes, within China you can use WeChat Wallet to send and receive money without bankcard. You can’t do international money transfer using WeChat, it is applicable for mainland China. However, you have an option in Alipay for international wire transfer which you can try. How about someone sent money from red packet? how can I transfer it to my bank card at withdraw it? You need to have a verified Chinese phone number with a linked bankcard to transfer the money to your bank account. Otherwise, you can only spend by keeping it in the WeChat Wallet balance. My WeChat was opened in Canada but I moving to China. How will my wallet work? Can I attach different bank accounts with different currencies to my WeChat Wallet? We don’t think you can transact on multiple currencies. It works based on your local phone number and physical verification with bank card. After arrival in China, open a new account with China number and verify with your local bank card. Please do advise me how to collect money from wechat money transfer.. He transfer some money on my wechat account hes from china and im from the philippines.. What to do inorder for me to claim money transfer via wechat?? Should i go to bank? What to do? To turn money transfer into cash and claim it? You can directly spend from WeChat Wallet, or add a valid bank card and transfer the money to the card’s account. WeChat will automatically return the money if the receiver does not accept within 24 hours. Also, you should add the person as a friend and transfer money to avoid this. This is a strange question!!! You can’t send money to your own WeChat id [let the money be there, why one need to send and receive the same]. You can top-up WeChat from your bank card or transfer money to your card. Or send/receive from someone else. how to convert yuan to philippine peso when transfered the money in wechat acccount? It’s not a currency conversion tool, you need to withdraw to your China bank card and remit from the bank. What if i sent money to wrong person accidentally but using another person’s bank account? For example, i was confused that time. I sent the money to mr so & so and i key in his phone number but i key miss so & so’s bank account number. Mr so and so received the text nessage regarding the money but he doesn’t know where to claim the money, then miss so and so checked her account but it is empty. Who will receive the money? Does the money go back to my wechat account? If the recipient does not accept within 24 hours of transfer then the money will return back to the sender. We don’t think it is possible to send money outside China based on your account’s country. You should withdraw or spend from the Wallet if your account is in good status. If it is blocked then contact WeChat support for assistance. Less can be done if you are outside China. Why can’t I send money all of a sudden? I have successfully sent 500, 200 and 200 but when I tried again. I couldn’t send anymore. Have you experienced such? My money is stuck in my wallet. I am loosing hope. Please help. Check your WeChat account is not blocked for suspicious activities. If account is blocked and money is struck in wallet then you need to contact them though their help center. You should activate the WeChat Payment and have mainland China or other accepted countries account. If that’s fine then contact them to resolve the dispute.